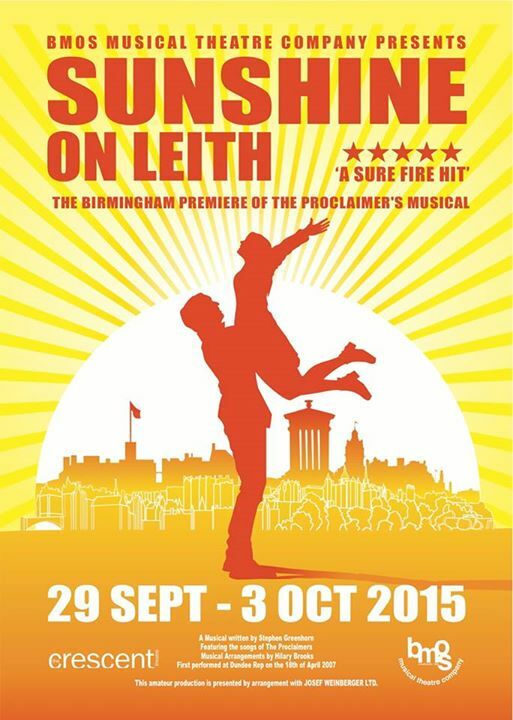 Birmingham Midlands Operatic Society present the Midlands premiere of the Proclaimers’ musical, Sunshine on Leith at the Crescent Theatre, Birmingham (Tuesday 29th September – Saturday 3rd October 2015). This production features direction by Stephen Duckham, choreography by Sally Jolliffe and musical direction by David Easto. This show tells three love stories simultaneously: Davy Henshaw and Yvonne, Ally and Liz Henshaw, and Jean and Rab. Ally and Liz are reunited after Ally’s release from the armed forces, yet their love affair is short lived when Liz decides she cannot commit as she wants a life, leaving Ally heartbroken. Davy and Yvonne live an emotional rollercoaster yet find true love within each other eventually. Rab and Jean have been married for 30 years, however problems still arise when the past returns to haunt Rab and he later suffers a heart attack. Luckily, the couple find peace and happiness together. Before the show started, we were greeted pleasantly with a professional bagpipe musician, a Scottish Tradition. The performance began promptly and from beginning to end, everybody in the audience was totally engaged. The cast of around 25 is led impressively by Chris Johnson as Ally and Mark Walsh as Davy, both displaying excellent characterisation and both with enjoyable vocals. Accompanying this pair were Maria Rodriguez as Liz and Brookyln Barber as Yvonne. Both gifted actors, the girls also delivered memorable vocal performances. This show wold not have been complete without the wonderful performances brought to the stage by Sharon Tozer and Robert Fusco as Rab. Emotions running high throughout, the pair had real chemistry and proved themselves of a significantly high standard. A smaller part was played by Sophie Koumides (Margaret), yet this was one of the emotional peaks of the show. I commend her performance – a gifted young actress, who also shone through in her ensemble performances. She was accompanied by Drew Rafton (Young Rab), again delivering an emotional performance alongside Sophie. Not forgetting, however, the wonderful performances brought by every single member of the ensemble, who displayed real enthusiasm and in-depth characterisation. If I was to name every cast member who I considered impressive, I’d be naming the entire of Birmingham Midland Operatic Society’s company. This is a near professional standard production and is not one to be missed. Sunshine on Leith runs at the Crescent Theatre until Saturday 3rd October 2015. This entry was posted in Amateur Reviews on September 30, 2015 by undercovertheatre.